This fund was created by Marian Newell as a memorial to her husband. Frank Newell (1915-2000) was a graduate of Millikin University. He retired from Nicor in 1975 after thirty years in various accounting positions. Mr. Newell was an instructor of Celestial Navigation in the Army Air Corps during World War II. 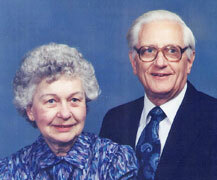 He also was a member of New England Congregational Church in Aurora. Marian Newell attended Millikin University and has belonged to several organizations in Aurora including P.E.O. Chapter BT, Daughters of the American Revolution, Midwest Early American Pressed Glass Club and the Woman’s Club of Aurora. She is a member of New England Congregational Church in Aurora.